For the past eight years, a highlight of the Halloween season has been 12 Hours of Terror at Capitol Theatre in Gordon Square. From 8 p.m. on Saturday, Oct. 21, to 8 a.m. on Sunday, Oct. 22, the theater hosts a full night of cult horror favorites. This year’s lineup includes Hellraiser, Dr. Butcher, MD, Pet Sematary, Motel Hell, Rawhead Rex, Freddy vs. Jason and a secret film to be revealed at the event. Tickets are $30 in advance or $35 day of the event. Tickets are available at the box office or online. 12 Hours of Terror is a strictly 18-and-over event, and no one younger will be admitted. Local artist Chad “CHOD” Kimes will again be selling movie-themed prints in the lobby. 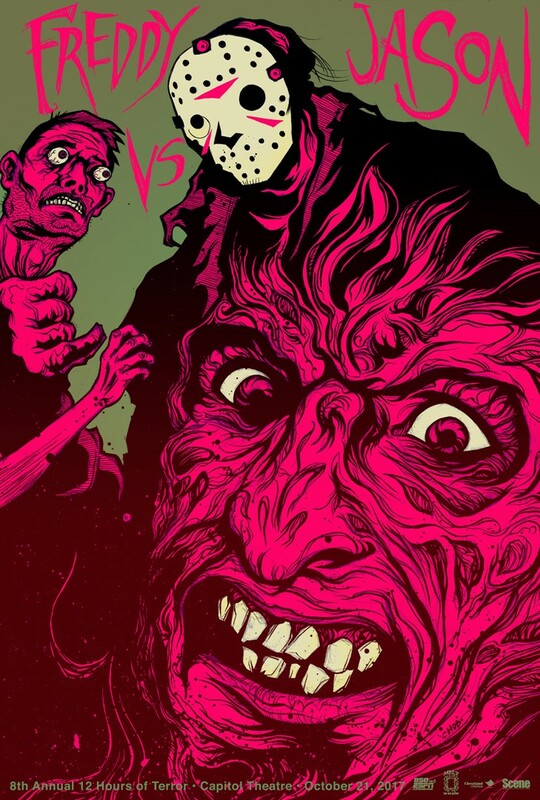 Kimes has done the main promotional poster art for all eight years of 12 Hours of Terror, and has made poster prints for each of the individual films for the past three years as well. Individual prints are $10 each, buy two and get a free print of the secret film for free. Sets of all seven prints are $50. Following the event, his year’s movie prints will also be available at the Mummy and the Monkey’s Thrift Crypt (13349 Madison Ave., Lakewood), where Kimes’ work is currently on display. During the month of October, the Mummy and the Monkey’s Thrift Crypt presents 13 original works by Kimes, as well as many prints. Although Kimes’ work isn’t exclusively focused on the horror genre, October was the perfect time to showcase some of the artist’s Halloween and horror-themed work. Clearly, the genre has made a deep impact on Kimes and his dynamic, illustrative work. Kimes’ work is hosted in the store’s Grimm’s Corner, a space dedicated to exhibiting local artwork. Kimes grew up outside of Canton and received his BFA in Illustration from Columbus College of Art and Design in 2000. Kimes moved from Columbus to Cleveland in 2008. Since then, he has won awards from the Ohio Associated Press and received a commendation from the Ohio House of Representatives for Outstanding Accomplishment in the Graphic Arts. Although Kimes has taken a break from exhibiting in local galleries recently, he continues to be as active as ever. In the last year, he has participated in several conventions, including Wizard World Cleveland and Five Points Festival in New York City. He sold prints at Nelsons Ledges over the summer, and once again participated in Carol & John’s Free Comic Book Day in May, creating an original work in their annual, themed art exhibition and giving away free drawings to customers. Kimes’ work remains on view at The Mummy and the Monkey’s Thrift Crypt through Halloween. Sold works are cash-and-carry, but Kimes has provided extra originals to keep 13 works on display throughout the month. That means you can buy the work and display it before the holiday, and guests have the possibility of viewing and purchasing new work throughout the month. (Capitol Theatre) 1390 West 65th St., 216-651-7295, clevelandcinemas.com.